Miso Crafty Knits: I've been a bad blogger! I know, I know...I haven't been doing anything on the blogging front. And I'm sorry for that! The past few weeks I haven't really been feeling so great. I've been feeling quite exhausted and burnt out, and to top it all off my newly developed allergies have kicked it into high gear. Definitely not fun times! I haven't been able to have a moment to myself, if I'm not chasing after the Munchkin or doing housework, then I'm at work. If I'm not doing any of those things then I'm most likely passed out in bed from sheer exhaustion. Ugh. I think the main cause of my fatigue is due to my little one. He's currently teething (again!) and has 5 more teeth cutting through. This time, it's the incisors and molars, all of which are really wrecking havoc on his gums and making them and his cheeks swell triple their original size. Amidst all this teething business, the Munchkin's energy level has skyrocketed, making him into a little hellion! Since the energy spike and the day that we let him walk around the block without his stroller, he's been refusing to go into his stroller - which makes for taking him anywhere utterly difficult and tantrum filled. Again, definitely not fun times!! He has had a few (super cute) quite moments...like the one in the photo above. 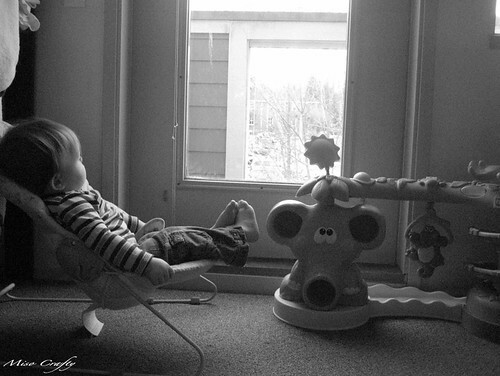 He's rediscovered his old baby chair while Brett was rummaging through the wee one's closet (looking for the parts to turn the crib into a toddler bed) and has dragged it to the door of his balcony, where he likes to sit, stare out the window, and watch the birds that flock around the tree outside. I've been enjoying those moments! Anyways, because of my lethargic state all my crafty endeavors have been put on the back burner in favor of sleep. I have been doing some knitting here and there, even managing to finish the infinity scarf that I blogged about in the last post. Other than that though, not much else has been done. I'm hoping that with that extra hour of daylight (yay time change!) and with spring around the corner that I'll be able to get around to my other crafts. But we'll see. In the meantime, I'm really hoping that this lethargic phase of mine will disappear...and soon! I hear ya, it seems as though spring is not conducive to knitting time this year! Will you be at the knit meet on Sunday? I would love to catch up with you.